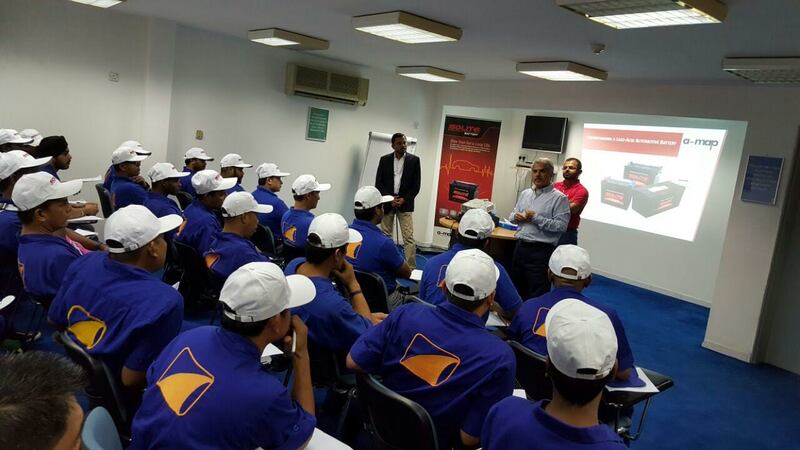 Al-Muqarram Auto Spare Parts Trading [A-MAP], a global player in the distribution of aftermarket automotive products, has recently conducted car battery maintenance training to 70 personnel of the Sales and Technical team at Fasttrack. The training was conducted by Ramamurthy Rao who heads up the R&D, Technical & Quality Assurance division at A-MAP, and was aimed at equipping Fasttrack’s Sales and Technical team with knowledge on Lead Acid Automotive Batteries and Solite Batteries in a step towards offering avalue added service to customers. The training program detailed the functions and roles of an automotive battery, understanding the specifications of part numbers, warranties and the significance of standards in defining various part numbers as per different international standards. Also included in the training was an introduction to Hyundai Sungwoo, the makers of world-renowned Solite Automotive Batteries, and the services A-MAP has to offer through its global network, R&D and quality focus and their system-based warehouse. Solite is one of the preferred batteries for Fasttrack’s customers in the UAE. Fasttrack is located at Emarat and ADNOC service stations in Dubai and Northern Emirates.